Shofukutei is a traditional soba & udon restaurant which have been running since 1938 and loved by local people for a long time. The signature point of this restaurant is that all of soba served (both of cold and hot) is green tea soba. 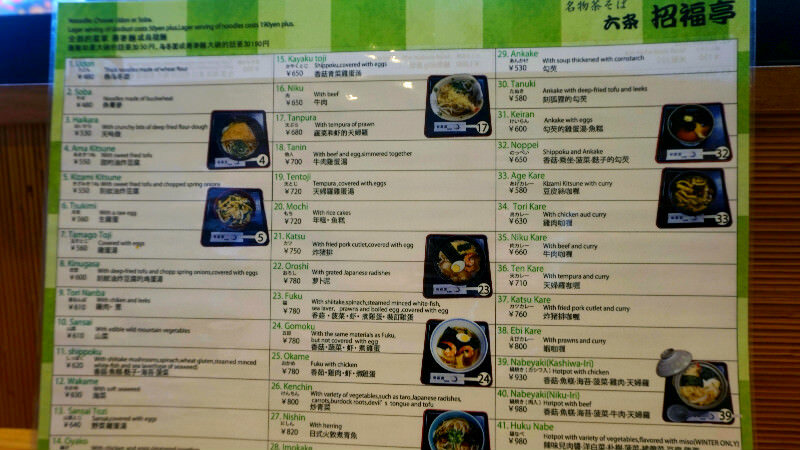 The main theme of the restaurant is offering the traditional taste with low price and they believe that it will contribute to customers' health. They keep their own style from its opening and offer the dishes which have really good taste. They take pride in dishes they make. The restaurant is crowded with local people throughout the year. The appearance is glossy and shining, its texture is dumpling and good for throat. Tea soba was made with matcha from Uzi-city where is the south of Kyoto and a famous tea producing area. The taste is amazing! I would like to eat it on a hot summer day. You don't need to choose between soba noodles and rice here, you can have them both. The soba noodles are of course really good, but so is the tonkatsu deep-fried pork rice bowl. The bowl is covered by a tonkatsu omelet, the taste is deep but at the same time mellow. And there is quite a lot to eat so by the end you won't have room for dessert. Udon or Donburi, a bowl of rice with food on top are available in the restaurant. if you would love Japanese spice, please add shichimi or Japanese pepper to a hot Udon or a Donburi. Green soba noodles! Need I see more? The noodles here have a faint scent of tea, but what I found the most interesting here was what you can get with the noodles. I really liked my deep-fried pork with rice and egg, and the tempura here is also really well made. You are bound to leave this restaurant with a full tummy. 7 minutes by walk from subway Karasuma line Gojo station. Open daily except for New Year's and Obon holidays.